Here is a list of kid friendly hotels in Las Vegas. I carefully checked that the hotels I recommend here are suited for kids. 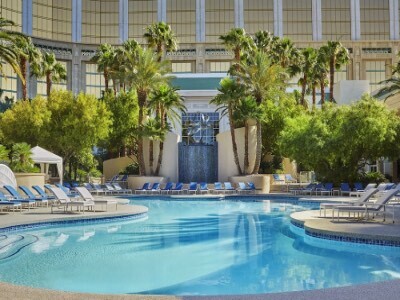 Review: The For Seasons Las Vegas is the ideal choice if you are looking for a luxury and quiet, no-casino hotel that helps you forget you are in the Sin City! The Four Seasons is one of the most kid friendly hotels in Las Vegas, although a very expensive one. However if you take into account all the freebies and no surprise resort fee common in many luxury Vegas hotels, and the fact that it's small size and super high service standards can make you and your whole family feel like celebrity, the price is not that bad. The Four Seasons Hotel actually loves and welcomes families and offers all sorts of family activities and spoils kids with popcorn and soda, children's menus and playstations (surcharge). It's a small and intimate hotel, and it's located inside another family-friendly Las Vegas hotel, Mandalay Bay Resort, but it has a separate entrance so your kids don't need to go through a smoky casino every time they go in and out. 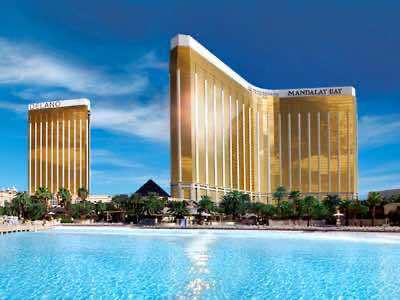 If you have a sudden surge to gamble, you can easily go do that at Mandalay Bay! 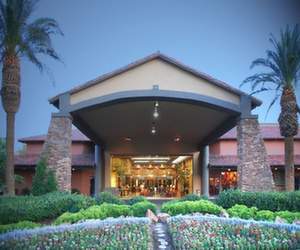 There are restaurants on site - an Italian Verandah featuring green natural decor, and an upscale Charlie Palmer Steak. Each restaurant has a bar, and there is also another bar at the picturesque lagoon-style pool. There is also a kids-only wading swimming pool at the hotel. Review: The Mandalay Bay Las Vegas is one of the most fun kid friendly hotels in Las Vegas, where they really do love kids! It offers the best of both worlds - play areas for both adults and for kids! Your children will adore playing in the wave pool and the lazy river, plus a visit to the the unique Shark Reef containing around 2000 animals, including sharks, turtles, crocodiles, etc. Now about you - if you like to play - there is a spacious casino with 2,000 slot machines and if you are looking for something even more extravagant, there is a poolside casino where you can play in a bathing suit! For shopaholics, there is this magic place called The Shoppes at Mandalay Place, nesting between Luxor and Mandalay Bay. If that's not enough, we counted 28 restaurants, some of which are located at Mandalay's sister properties Delano and Four Seasons (above). Night life at Mandalay Bay is Las Vegas is very intense - plenty of live music events and occasional boxing and UFC fights are held there at the Events Center or the Beach. Also we have to specifically mention the House of Blues restaurant/concert venue located at Mandalay - it's home venue of the rock band Santana and a hot spot where you can catch a lot of rock and pop concerts! 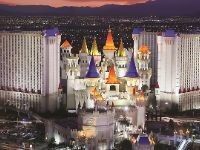 Review: The Excalibur Las Vegas is one of the largest, and perhaps one of the most fun of all cheap kid friendly hotels in Las Vegas! The hotel is named after the famous sword of King Arthur, and is shaped like a medieval castle, which is fun enough for some kids. Although service-wise Excalibur receives more of "very good" instead of "excellent" reviews, you are getting what you pay for, and you pay really, really little for the rooms. The hotel also charges a $15 resort fee, which is significantly lower than in high-caliber resorts in Vegas. Now about all the fun you and your family can get at the Excalibur Hotel. For kids, there is Fantasy Faire Midway called Fun Dungeon with plenty of rides and video games. The swimming pool is large and includes a splash pool with a water slide. Unfortunately, this completes the list of family-friendly entertainment at the hotel. Excalibur is not really geared towards children anymore - the adult male strip show Thunder From Down Under is playing there and is heavily advertised, so parental discretion is advised. There is live music playing every night at the hotel, including the regular show The Australian Bee Gees. The feature show at Excalibur, however, is the Tournament of Kings - a dinner show where you eat with bare hands, and watch jousting knights. If you don't like to eat with bare hands, there are eight other restaurant options, including The Steakhouse at Camelot and Buca di Beppo serving Italian dishes. If that's not enough fun, there is a Royal Treatment Spa at Excalibur, and a Castle Walk which is a shopping area, where you can find souvenirs, night gowns for women and fun clothes for kids. And of course, there is a casino if you want to combine the best of both worlds at one of the best Las Vegas hotels for kids! Review: The Circus Circus Las Vegas is a fun and the cheapest of all kid friendly hotels in Las Vegas - perfect if you are on a budget. If you can get over the slightly dated rooms (after all, the hotel was built in 1968! ), it's one of the best places to stay in Vegas with kids. The main attraction of the hotel is The Adventuredome, which is a huge theme park with exciting rides. For even more fun, try playing at the hotels arcade Carnival Midway featuring some 200 games. Besides, every 11:00 am daily, in the middle of the Midway, you can catch absolutely free circus acts with flying acrobats, skaters, jugglers! There is also a large swimming pool on site and a spa tub. This family friendly hotel in Las Vegas offers multiple dining options. Some restaurants such as Rock & Rita's host entertainment every night. Review: The rightfully named Desert Rose Las Vegas is one of the most highly rated kid friendly hotel in Las Vegas. Located very close to the huge MGM Grand, the hotel allows you to enjoy a quiet hideaway in the middle of the city buzz. Many hotel amenities are included: one and two bedroom suites with fully equipped kitchenettes, gym, beautiful tropical-theme swimming pool with a barbecue area, Free Internet. 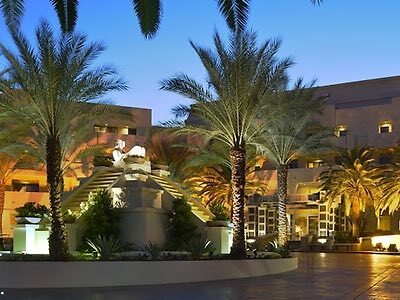 While the Desert Rose Resort does not have an on-site restaurant (except the small one that serves Free breakfast), it's conveniently located close to the Strip with access to plenty of dining options. Review: Located about 3 miles south of the Strip, with only 440 rooms, the Cancun Las Vegas provides a restful haven for families with children. Unfortunately, this kid friendly hotel in Las Vegas does not offer a shuttle service to the Strip, therefore renting a car is highly recommended. The Cancun resort offers 3 beautiful swimming pools with lifeguards, saunas, hammocks for napping near the pool. At their spa they offer facials and massages. Rooms are spacious villas and suites. The hotels restaurant Caribe Lounge offers Mexican cuisine, and there are also small kitchenettes in the rooms if you like to cook yourself. In terms of activity there is not much going on in the hotel, which is ideal if you want a quiet setting to rest after having fun on the Strip. Review: Alexis Park Las Vegas is an all-suites kid friendly hotel in Las Vegas, located only 2 blocks from the Strip and right across the Hard Rock Hotel and Casino if you want to gamble. Alexis Park Resort features Mediterranean architecture, beautiful gardens, three swimming pools, Pegasus Bar & Lounge. The poolside open air Alexis Gardens Restaurant serves variety of dishes, including seafood, steaks, salads. The hotel is located very close to the airport, which maybe a good reason enough to avoid it (or to come). The hotel also offers a free airport shuttle departing every 2 hours. Small pets are allowed on this property for a surcharge. Review: Desert Paradise Las Vegas is one of very highly rated, kid friendly hotels in Las Vegas with no casino with only 148 rooms. 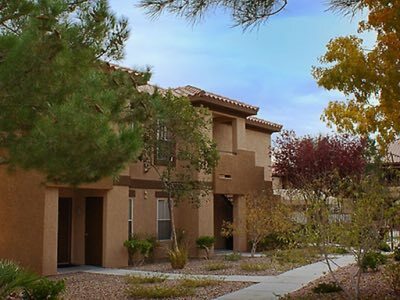 It's located 2 miles west of the Strip, which is easily accessible either by car or the free shuttle. Desert Paradise is a condominium-type resort with full kitchenettes, with condos featuring either balconies or patios. The outdoor pool is heated and open year-round, and there are barbecue grills, which is a nice touch. While the hotel does not have either restaurant or bar, there are plenty of these around. 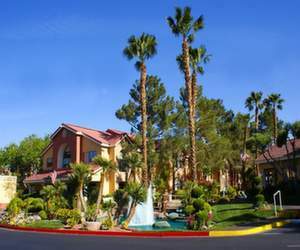 Review: Tahiti Village Las Vegas is an all-suite kid friendly hotel in Las Vegas, located 2 miles south of the Strip. With 800 rooms, it can get noisy or exciting over the weekend, depending on how you look at it. But it quiets down during the week. The hotel offers an excellent shuttle services that departs every 30 minutes and can take you to the Strip, to the Red Rock Canyon or to downtown. Tahiti Village has 3 kinds of Tahiti-inspired spacious suites called Moorea, Bora Bora and Royal Tahitian which is a combination of the first two. The centerpiece of Tahiti Village Resort is a long lazy river, which is heated in a cold season. The hotel also has a swimming pool with a sandy beach and a great area for kids. There is also a barbecue area nearby. 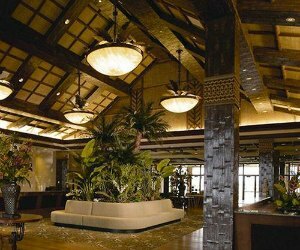 The hotels Tahiti Joe's Restaurant offers a variety of Tahitian and American dishes, including all-you-can-eat buffet. Food can be served at the pool or in the restaurant. There were a few complaints about the speed of service in the restaurant in the reviews, but the management deals with the issues, so this may have improved. Review: The small family Grandview Las Vegas Resort is located 8 miles off the Strip. The hotel offers a shuttle service for $8 dollars, so renting a car is recommended. There are one- and two-bedroom units in Grandview Resort with fully equipped kitchenettes, 5 swimming pools which is great for kids, a video arcade, activities center and children's play room and a fitness room. Internet is free in the business center. This kid friendly hotel in Las Vegas is located directly across the South Point Casino to satisfy your gambling needs. So you can use the Grandview for relaxing in the pool and the Southpoint for entertainment. Review: With spacious one and two bedroom villas sleeping up to 8 people, Westgate Flamingo Bay Las Vegas provides great value for your money! Plus, AAA members get a 10% discount at the resort. Villas offer fully equipped kitchen and fireplaces. With the modest number of rooms (208), it's a nice and quiet place. 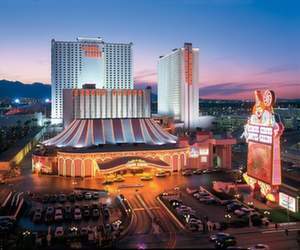 The Westgate Flamingo Bay is located 2,5 miles east of the Strip, and provides a shuttle service. 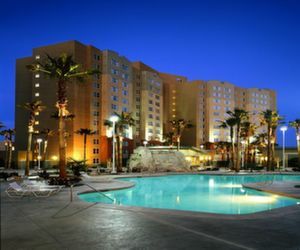 This is a tropical-style kid friendly hotel in Las Vegas, with nice heated swimming pool with whirlpools. There is also a playground for kids, barbecue area and a basketball court.